Project Description: Resin jewelry is all the rage! 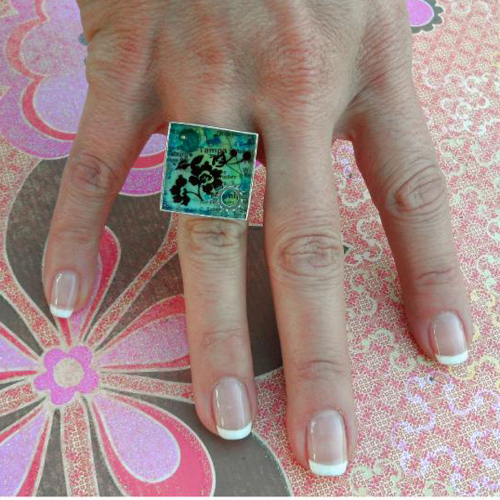 Create a shadowbox ring with vintage maps and steampunk charms, and then encase it in magical, glossy resin. Cut a square from the map using the ring as a template. Laminate it with packing tape, then trim. Glue into the ring bezel using a toothpick and the glue. Trim a silhouette from the printed Laser Film and glue it on top of the map. Layer a micro gear or locking washer and a sequin into the ring and glue in place. Sprinkle about 12 pieces of glitter into the ring. Fill the inside of the ring bezel with resin covering all the goodies inside. Use a straight pin to pop any bubbles. Cure under a black light or outside in the sun in a level position for 15-20 minutes.